She flowers from Summer into autumn and is now a welcome guest in any garden. Her colors are very bright and shining. She got her name after the student of the biologist Carolus Linnaeus, the Swedish botanist Anders Dahl, 18th-century. 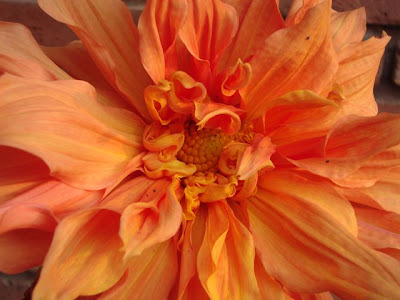 In 1872 a box of Dahlia roots were sent from Mexico to the Netherlands. Only one plant survived the trip, but produced spectacular red flowers with pointed petals. 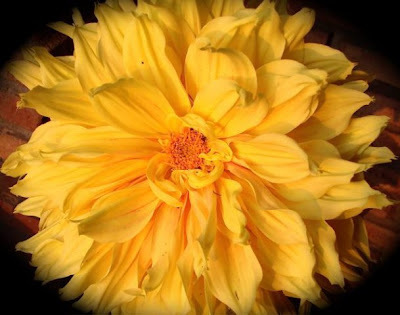 Nurserymen in Europe bred from this plant, which was named Dahlia juarezii with parents of Dahlias discovered earlier and these are the progenitors of all modern Dahlia hybrids. 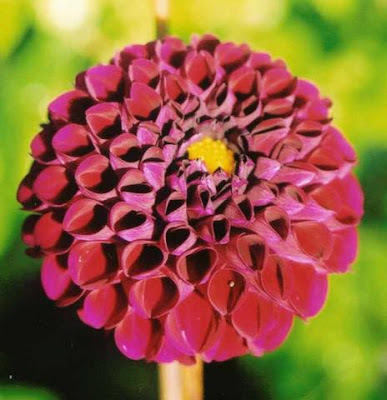 Ever since, plant breeders have been actively breeding Dahlias to produce thousands of cultivars, usually chosen for their stunning and brightly coloured flowers. Dahlia plants range in height from as low as 12" (30cm) to as tall as 6-8 feet (180-240cm). The flowers can be as small as 2" (5 cm) or up to a foot (30 cm) in diameter. The great variety results from Dahlias being octoploids (they have eight sets of homologous chromosomes, whereas most plants have only two). The blossoms can be seen most of the year, but in winter they are most enjoyable.
. Legends about Silk and Silkworms . 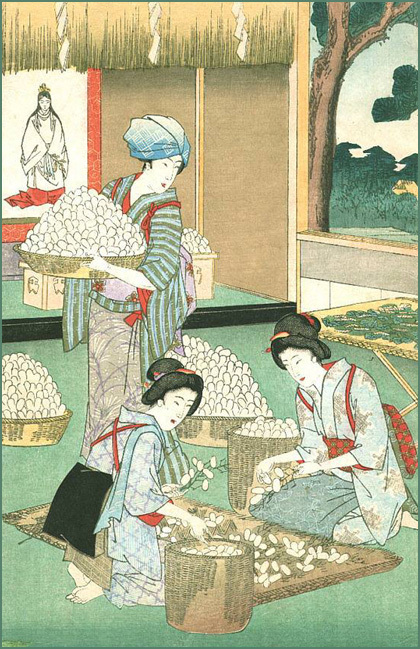 Tending to the silkworms was a local activity in many rural areas of the Edo period and many kigo related to these activities exist. Japan was the most Eastern country of the old silkroad, reaching up to Rome in Italy. According to legend, Otehime 小手姫, the empress-consort of Emperor Sushun 崇峻天皇の時代 (r. 587–92), fled to Kawamata after the emperor was assassinated in 592. There she propagated the arts of sericulture, or silkworm cultivation, and weaving. Silk is a natural protein fiber, some forms of which can be woven into textiles. 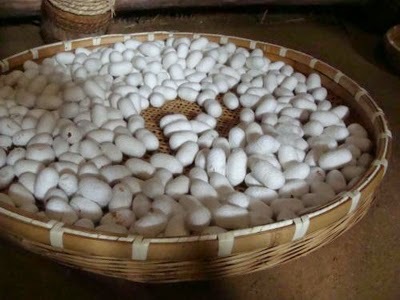 The best-known type of silk is obtained from cocoons made by the larvae of the silkworm Bombyx mori reared in captivity (sericulture). The shimmering appearance for which silk is prized comes from the fibers' triangular prism-like structure which allows silk cloth to refract incoming light at different angles. "Wild silks" or tussah silks (also spelled "tasar") are produced by caterpillars other than the mulberry silkworm (Bombyx mori). They are called "wild" as the silkworms cannot be artificially cultivated like Bombyx mori. A variety of wild silks have been known and used in China, India, and Europe from early times, although the scale of production has always been far smaller than that of cultivated silks. Aside from differences in colors and textures, they all differ in one major aspect from the domesticated varieties: the cocoons that are gathered in the wild have usually already been damaged by the emerging moth before the cocoons are gathered, and thus the single thread that makes up the cocoon has been torn into shorter lengths. Commercially reared silkworm pupae are killed before the adult moths emerge by dipping them in boiling water or piercing them with a needle, thus allowing the whole cocoon to be unraveled as one continuous thread. 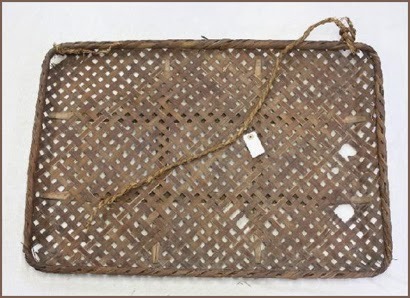 This allows a much stronger cloth to be woven from the silk. Wild silks also tend to be more difficult to dye than silk from the cultivated silkworm. There is some evidence that small quantities of wild silk were already being produced in the Mediterranean area and the Middle East by the time the superior, and stronger, cultivated silk from China began to be imported. Landscape of quick water from high mountain by Zhao Zuo, Ming Dynasty. Hand scroll, ink and colour on silk.Silk fabric was first developed in ancient China, possibly as early as 6000 BC and definitely by 3000 BC. Legend gives credit to a Chinese empress, Xi Ling-Shi (Hsi-Ling-Shih, Lei-Tus). Silks were originally reserved for the kings of China for their own use and gifts to others, but spread gradually through Chinese culture both geographically and socially, and then to many regions of Asia. Silk rapidly became a popular luxury fabric in the many areas accessible to Chinese merchants because of its texture and luster. Silk was in great demand, and became a staple of pre-industrial international trade. The first evidence of the silk trade is the finding of silk in the hair of an Egyptian mummy of the 21st dynasty, c.1070 BC. Ultimately the silk trade reached as far as the Indian subcontinent, the Middle East, Europe, and North Africa. This trade was so extensive that the major set of trade routes between Europe and Asia has become known as the Silk Road. The Emperors of China strove to keep knowledge of sericulture secret to maintain the Chinese monopoly. Nonetheless sericulture reached Korea around 200 BC, about the first half of the 1st century AD in ancient Khotan (Hill 2003, Appendix A), and by AD 300 the practice had been established in India. ©　WIKIPEDIA has more ! Many old farmhouses were especially constructed for raising the silkworms in the second and third floor. 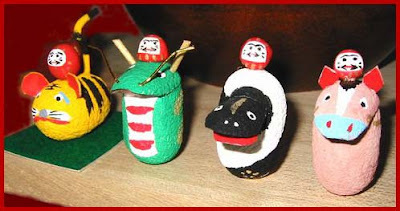 harubiki ito 春挽糸 (はるびきいと) "thread from spring"
These harugo, haruko 春蚕 "silkworms of spring" are said to produce the best silk of the year. They yield a natural yellow silk and are very percious. To let the cocoons dry naturally. It produces a natural green silk thread, but is very hard to grow for farmers. Getting the threads from the cocoons and then spinning them was the work of the female farm workers, mostly the elderly, sitting on the veranda spinning all day. 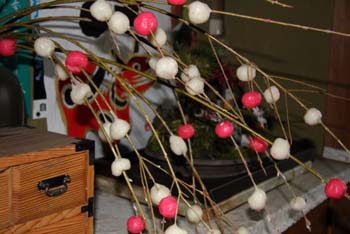 small round mochi as decoration for the "small new year" (koshoogatsu) on January 15. They are put on twigs and decorated in the home, usually in the auspicious colors of white and read. They are thank you gift for the deity protecting the silkworms. She carries a mulberry branch in her hand. Stone statues like this are common in areas with silk production. Silk is worn all year round, but its warmth is felt best at the beginning of the cold season. O-Shirasama, Memyo Bosatsu, the Hata clan　秦氏　and much more about sericulture. 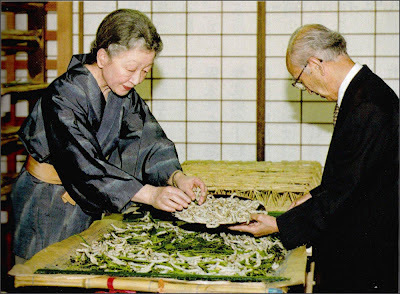 Empress Michiko helps with joozoku 上蔟, mounting silkworms on trays. The silkworms, Koishimaru 小石丸 have become about 6 cm long. Daruma san was very important as a protector deity for the Japanese silk industry. She was the most famous Haiku Poet of the Tama area of her time. Hachioji 八王子 was a prosperous town along the silk road of Japan at her time. Matsuo Basho included a haiku by Sora about silkworms in "The Narrow Road:"
The season word is kogai which is usally a spring word and in that sense it does not fit the season. There are two explanations for this. 1)This refers to the second crop of silkworms, summer silkworms. 2) Cultivating silkworms is a springtime occupation, but it is in summer that they make their cocoons, so there is a natural extension from spring into summer for this enterprise. 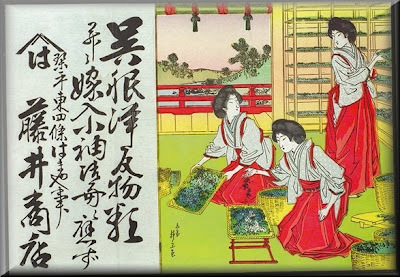 Since Basho was in Obanazawa for ten days beginning 5.17 (7.3), there is no way this poem could represent spring, so we should probably consider these to be summer silkworms. striking flints (as a purification ritual) and tying back the sleeves with special cords. These interpretations may be extreme, but the reference probably does have to do with forms of dress. One author suggests a special kind of mompe work pants called fugumi worn by the women of this region. In any case it seems to be an unusual style of dress and one not found around Edo. It is a style which seems to suggest a simpler age and thus antiquity to Sora. This poem reflects the poet's interest in the simply dressed figures of the people who tend their silkworms. The poet imagines this is what people must have looked like back in ancient times. We know from another work that Sora had written a draft of this poem earlier on the trip and refined it at this point to go along with Basho's poem about the toad. It is not clear whether Sora made the revision, or whether Basho may have done it. In any case, the silkworm cultivators suggest an image of the ancients. The poem seems shallow when we compare it to Basho's preceeding poem. Sora's poem lacks a lyrical note. Although this poem uses the same technique of a simile as Basho's Mayuhaki, it lacks the richness of association. The Haiide yo poem makes a contrast between the rustic and the humorous. The Tsuzushisa poem has charm, but Sora's poem is merely descriptive. Perhaps Basho chose to include Sora's poem at this point to serve as his companion's greeting to their mutual friend Seifu. It has been suggested that Basho saw himself in the sick silkworm. The haiku was written in 1694, the last year of Basho's life. According to Yamamoto, in Ueda's "Basho and His Interpreters:"
The poet saw his own image in the lone silkworm ailing in the mulberry field. 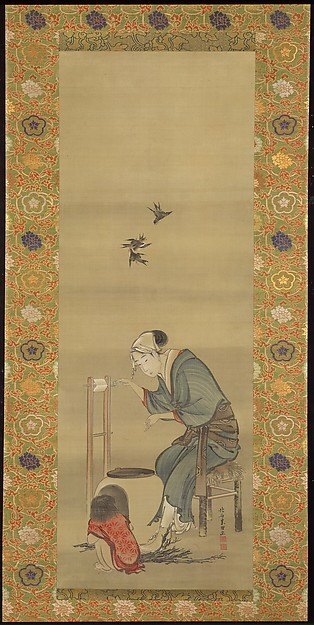 Again it was recorded that Basho was fascinated by the idea of a "sick silkworm" and wanted to use the image in a poem. Bridget Dole comments, "I am reminded of something I read about the raising of silkworms and how the families with silkworms in their attics were very careful of the silkworms' moods. They were careful not to make loud noises, display discord, etc. because they needed the silkworms to spin uninterrupted (a cocoon is made of one long strand of silk. If a silkworm stops spinning, it may not have enough silk left to make another cocoon). Anyway, I'm just wondering if toraruru could be translated to indicate the catering of the people to the silkworms." Paper: handmade Japanese Mulberry with grey and blue Suminagashi Marbling. Tradition Oriental binding with folded fore-edges and stab binding on spine. Sewn with black silk. Red and grey brocade covers in slipcase. The leaves were used to feed the silkworms. shimo kusube 霜くすべ (しもくすべ 【霜燻べ】 ) "frost and smoke"
. mulberries, kuwa no mi 桑の実 (くわのみ) . I was out shopping the other day when I saw six women beating my MIL up. As I stood there and watched, her neighbor, who knew me, said, "Well, aren't you going to help?" I replied, "No. Six of them is enough". 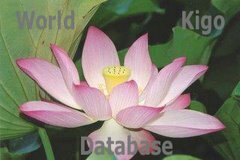 is a topic for haiku and senryu. Are they out-laws or in-laws? Why has the world made this position of a woman look so horrid? Is this man’s making or is this our own making? India is known for its joint family system. For generations families have lived together harmoniously – learning to let go and share love, which is the most important thing in life? With the advent of modern living, seeking jobs outside one’s country this need to adjust in a joint family is fast becoming redundant. But does that make a mother-in-law’s position any less important? It is a time honored tradition in India that the groom, riding a mare, leads a procession of friends and dear ones to the bride’s home, where he is given an auspicious welcome at the door by his mother in law and other women of the household. On one such occasion, a lady stood welcoming the congregation, eagerly looking out for her son in law. Before the groom entered, she witnessed numerous of his friends going in. All were beautiful, handsomely dressed and immaculately turned out. What would the groom himself be like, when those preceding him were so attractive? She couldn’t suppress her excitement. "O daughter what have you done, you have ruined your family. Surely you were not in your senses when you made your choice. Why did I not remain a barren woman rather than give birth to you who has bought ill fame to the whole family. You have put away sandal paste and instead smeared yourself with mud, throwing away rice you have eaten the husk." my full Italian mother... my wife whispers, "pasta this!"